SAB Presents Fall Comedian "Broad City"
Rotary Presents "A Taste of the World"
Delta Sigma Pi, Phi Sigma Pi and Phi Delta are working together to host several “Be the Match” bone marrow donor registration drives Nov. 11-12. Individuals interested in being on the national bone marrow registry will have the options to register from 11 a.m.-4 p.m. in the Student Union Building Down Under or from 5:30-8 p.m. on the first floor of Missouri Hall, Nov. 11 and Ryle Hall, Nov. 12. What is bone marrow donation? Donated blood marrow is used to treat patients suffering from blood cancers and diseases. Patients often require chemotherapy and radiation, which destroys their diseased marrow. During the process, healthy blood forming cells donated by members of the marrow registry are given directly to patients through the blood stream. Once accepted by the body, the healthy cells will begin to multiply and function as patient’s cells. To join the registry, individuals must be 18-44 years old, have no major allergies, be in generally good health and have a willingness to commit to going through the donor process if they are found to be a match. There is no cost to register between these ages. Individuals 45-60 can join the registry with a $100 tax-deductible payment. However, research shows that cells from younger donors provide the greatest chance for transplant success. How long does it take to register and what is involved? The registration process takes 15 minutes and involves answering a short list of health questions and collecting a cheek cell sample. It is important to remember that the cheek cell sample is used to find potential matches and is not a donation. After joining the registry, samples are stored and compared to those of patients suffering from blood cancers and diseases. Matches are made based on the human leukocyte antigen (HLA), which is a marker cell that lets the body know what cells belong to it. Similar HLA cells are needed so that the body will accept the donation. Finding a match can be hard because HLA cells differ greatly, even among family members. 70 percent of those diagnosed with blood cancers will not match a relative and must rely on the registry. You’re a match, now what? If matched with a patient, the potential donor will complete further testing to verify the match. There are two different methods for donation. The most common method of extracting blood-creating cells is peripheral blood cell (PBSC). This is a process that removes the blood from the donors, separates the cells and returns the blood back into the donor. The donor will also be required to take a series of five shots over a five-day period prior to the donation to increase the number of blood forming cells. Using the PBSC process, 90 percent of donors are done after one session. Donors may also be asked to complete a bone marrow donation, which is done through a surgical procedure in which bone marrow is extracted directly from the hipbone. This procedure can be done with general or local anesthesia and usually is an outpatient procedure. Both forms of donation have minimal side effects. A PBSC donation could result in tingling sensation in mouth, fingers and toes. Mild flu-like symptoms can result from the shots leading up to the PBSC procedure. While bone marrow donation could result in pain within the withdrawal site, it is comparable to an aching back or a pulled muscle. While donors are more likely to be asked to complete a PBSC than a bone marrow donation, the physician of the patient will determine the type of donation and neither procedure is guaranteed. Donors will never be asked to cover the costs of donating and are never paid for donating. All medical costs and travel expenses are covered by the "Be The Match" registry or by the patient’s medical insurance. Every new potential donor that registers increases the likelihood that a patient will find a match. For many patients, finding a match can be the difference between life and death. Students play a larger role because younger donors increase the chance that the transplant will be successful. Typically, the umbilical cord and placenta are discarded after a baby is born, unless the parents decide otherwise. A donor can choose to have the cord blood collected and donated to a public cord blood bank, stored in a family (private) cord blood bank, or saved for a biological sibling who has a diagnosed medical need. While joining the registry is a quick and easy process, it is not the end of the donor’s commitment. It is vital that all potential donors realize the responsibilities that joining the registry has before completing the initial steps. A potential donor will be responsible for keeping their contact and health information up to date. By joining the registry a potential donor is committing to donate to any patient with whom they may match. While every potential donor has the right to refuse, the fundamental purpose of the registry is to save lives through donation. Once joining the registry, samples will be kept until the donor reaches the age of 61 or requests to be removed. In honor of Breast Cancer Awareness Month, Alpha Sigma Gamma will host their annual Breast Cancer Awareness Week Oct. 26-30. The week will feature a variety of events to raise proceeds and awareness on campus. A full schedule of events is listed below. Last October, Dr. Theresa Heckert participated in the annual event and shared her personal journey with breast cancer. Heckert was a professor of psychology for 20 years before passing away Feb. 19, 2014. 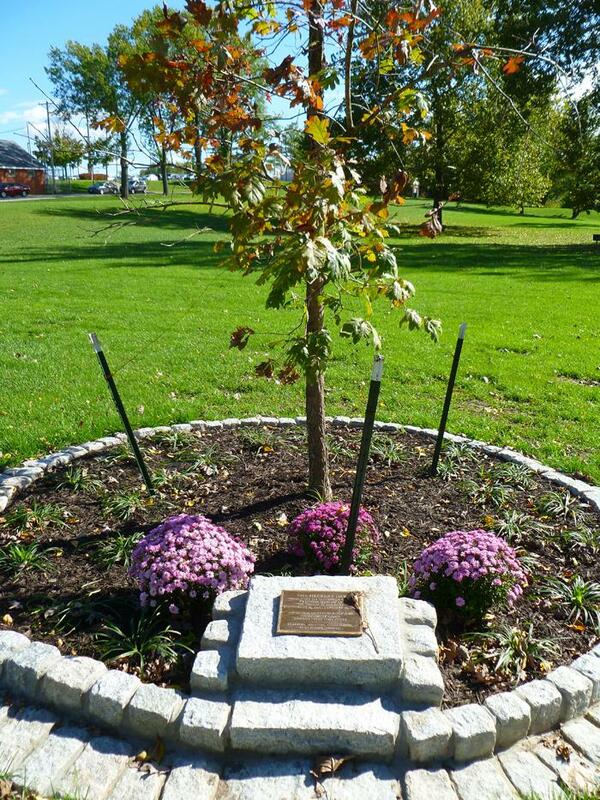 A vigil service honoring Heckert and other loved ones affected by breast cancer will take place at 5:15 p.m. Oct. 30 at the Heckert memorial tree in Red Barn Park. The event is open to the public. All proceeds raised during the week will be donated to Bright Pink. For more information about events, contact Kim Wronkiewicz at kmw7342@truman.edu. Student Activities Board will host comedic duo Ilana Glazer and Abbi Jacobson at 7 p.m. Nov. 15 in Baldwin Auditorium. "Broad City" is a comedy show that centers around Ilana Glazer and Abbi Jacobson. They started out as a cult hit web series in 2009 on YouTube where Glazer and Jacobson found humor in their day-to-day lives as two 20-something women living in New York City. The web series continued until early 2014 with its debut on Comedy Central as a television show with executive producer Amy Poehler. The show has been featured in the New York Times, MTV and Late Night with Jimmy Fallon. It also was nominated for the 2014 Critics’ Choice Television Awards: Best Comedy Series. "Broad City" has been renewed for a second season on Comedy Central that will start in January 2015. Doors will open at 6:30 p.m. The event is free for students with a Truman ID and $5 for general admission. Tickets will be available in the Student Activities Office, located on the lower level of the Student Union Building, beginning Nov. 3. For more information regarding upcoming SAB events, visit sab.truman.edu or call 660.785.4722. Thanks to an agreement between Truman and the Missouri History Museum in St. Louis, Truman students have the opportunity to apply for two summer internship positions. The museum is seeking individuals with strong written and verbal communication skills, strong organizational skills, the ability to work independently on multiple tasks and knowledge of basic computer skills. Once selected, students can be assigned to a variety of areas based off interest and skill level, including archives, public relations, marketing, educational programming, museum development or visitor services. The eight-week, 20-hour per week internship will coincide with the University’s eight week summer session. Although positions are unpaid, students can earn between three to five credit hours. Selected individuals will need to enroll for academic internship credit with an eligible department. The Department of History will approve credit, but students should verify with a departmental head or advisor if interested in other credit. For more information or to get an application, contact Jeff Gall at 660.785.7747 or jgall@truman.edu. The deadline to apply is Dec. 1. The Fall Career & Grad School Expo took place Oct. 1 with 110 exhibitor tables in three rooms of the Student Union Building. More than 700 students attended the expo, representing 32 of 35 Truman majors. Several recruiters stayed Oct. 2 to conduct 166 on-campus interviews for internships and jobs with their organizations. The entire week was filled with career development opportunities including mock interviews, an etiquette dinner, a volunteer fair showcasing local agency opportunities and company presentations. A LinkedIn consultant, co-sponsored by Delta Sigma Pi and Alpha Kappa Psi, also presented advice on building a strong online presence using this professional networking site. The Spring Career Week will take place Feb. 23-26 with the Career & Grad School Expo on Feb. 25. Career Week is planned and coordinated by the Career Center with the assistance of Delta Sigma Pi and Alpha Kappa Psi. For more information, contact the Career Center at 660.785.4353. Truman’s Forensic Union, speech and debate team, attended its third tournament Oct. 18-19 at the University of Central Missouri. Thirteen students traveled to Warrensburg to compete in the Missouri Mule and the Dale Carnegie Invitational. The Missouri Mule on Oct. 18 proved the team was in their stride. In Lincoln-Douglas debate, six students advanced beyond preliminary rounds to elimination rounds. Junior Mackenzie Barnes, sophomore Alec Hubbard and junior Sarah Muir each advanced to double-octafinal rounds. Junior Dillon Laaker and freshman Connor Stewart each advanced to the octafinal rounds. Sophomore Donny Richardson advanced all the way to the semifinal round. In individual speech events, sophomore Anson Long-Seabra made it to finals in poetry interpretation, where he took first place. On Oct. 19, the team’s success continued. Hubbard advanced past preliminary rounds in Lincoln-Douglas debate and reached the octafinals. In individual speech events, Long-Seabra made it to the final round of poetry interpretation and placed third. Long-Seabra also made the final round of after-dinner speaking where he was unanimously ranked the top speaker, placing first in the event. The Truman Forensic Union will split the Nov. 8-9 weekend for their next tournaments. Debaters will travel to the inaugural Red Bird Invitational hosted by Illinois State University. The individual events team will travel to the Lynn Ross Invitational and Alumni Tournament hosted by Kansas State University. Participation in the forensics program is open to any Truman student in good standing, regardless of prior speech and debate experience. For more information, visit forensics.truman.edu or contact Christopher Outzen, director of individual events, at coutzen@truman.edu, or Kevin Minch, interim director of forensics at kminch@truman.edu. 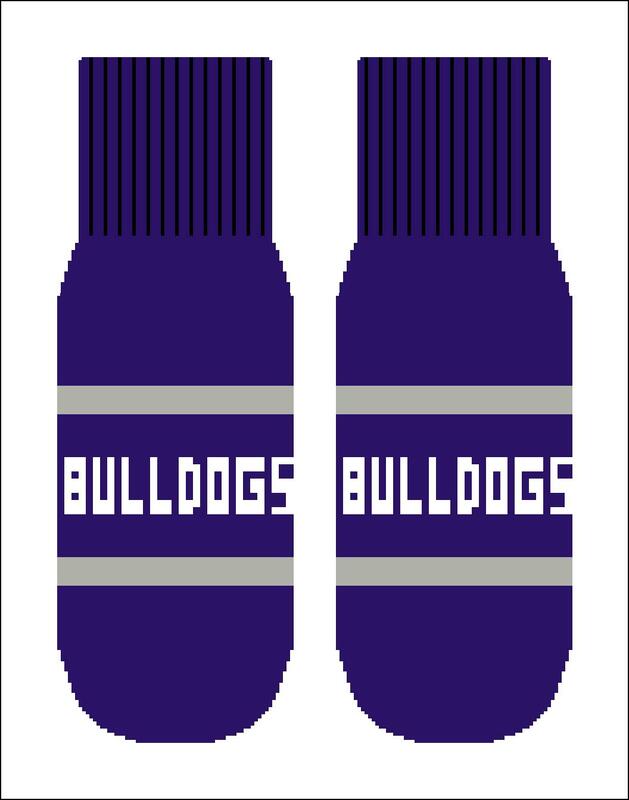 Lambda Alpha Epsilon will be selling Bulldog mittens from 10 a.m. to 4 p.m. Oct. 27-29 in the Student Union Building and Oct. 30-31 in Barnett Hall. The price is $10 a pair and all proceeds will go to Victim Support Services. To place an order, visit the tables or email truman.lae@gmail.com. All clothes are hand-made by families in Bolivia. Items include sweaters, gloves, hats, scarves, socks and leg warmers. Proceeds go back to the families for their income. Cash is the only payment accepted. Those students who are interested in a paid spring internship opportunity still have an opportunity to apply for the Missouri Government Internship program. This internship gives students the opportunity to gain real, meaningful experience in the fast-paced world of state politics. If selected, interns will be working full time alongside staffers in the office of a state legislator, state agency or state executive. Through interning at the Capitol, students will expand their knowledge of the workings of state government and build a tight-knit and diverse professional network. Interns are eligible to receive up to 15 hours of credit for their work at the capitol and also will be compensated for moving and living expenses with a $2,500 stipend. Daily tasks vary depending on the office, but interns can expect to attend public hearings and complete legislative research. Other duties may include writing and editing published materials, preparing for hearings, tracking legislation, constituent relations, attending fundraising events, writing speeches and assisting with basic office work. In order to participate in the Missouri Government Internship, students must have completed at least 60 hours and spent a minimum of two semesters at Truman. Students will only be considered with a GPA of 2.75 and higher. All majors are eligible and encouraged to apply. While there is no required coursework prior to the internship, applicants must be hard working, motivated, professional and eager to learn. Interviews are currently being conducted. More information and applications are available online here. For more information, contact Candy Young or Heidi Templeton. 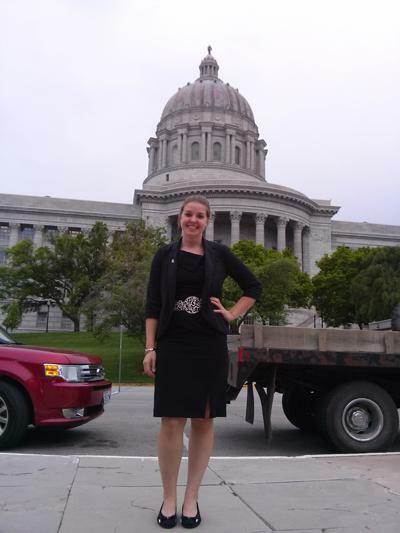 Spring 2014 Intern Jessica Hamilton poses in front of the Capitol building’s iconic dome. The School of Business and the Bulldog Student Investment Fund are hosting “From Breadth to Depth: Theorems and Conjecture from a Liberal Arts Hedge Fun Manager” featuring Lee Slonimsky of Oceans Partners LP at 4:30 p.m. Oct. 27 in Baldwin Little Theater. Slominsky will speak about his liberal arts background and his interests in mathematics, finance and poetry. He will also discuss his views on current financial markets, investment strategies and his advice for students. Students of all majors are encouraged to attend. There is no cost to enter. Jack Smith, novelist, editor and critic, will give a reading from his latest novel “Icon” at 7 p.m. Oct. 29 in the Student Union Building Georgian Room C. The event is sponsored by the Department of English and Linguistics. It is free and open to the public. Students thinking about going to graduate school should consider applying to the McNair Program. Learn more about this valuable resource and the eligibility requirements by contacting Janet Blohm-Pultz, program coordinator, at jblompultz@truman.edu, 660.785.5393 or stopping by her office in Adair Building Room 301. Program applications are accepted Oct. 1- Nov. 1 at mcnair.truman.edu. 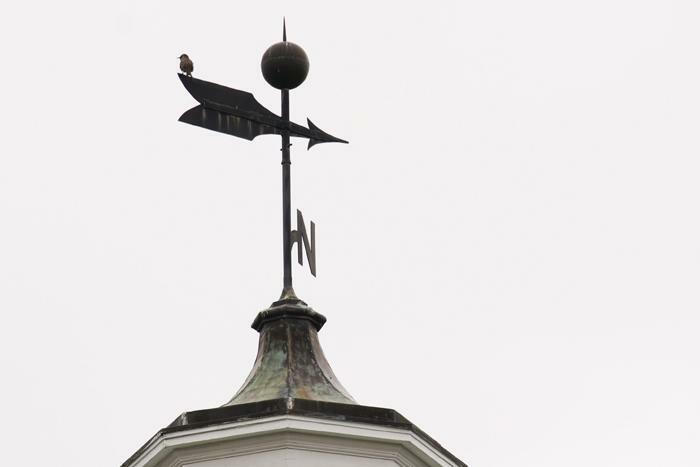 Truman will host its 25th annual undergraduate Philosophy and Religion Conference from 9 a.m.-5 p.m. Nov. 1 in the Student Union Building Alumni Room. The keynote speaker will be Dr. Manuel Chavez, Jr., from Monmouth University. Chavez will present on the topic “Ethics and Anti-Racism” at 12:30 p.m. in the Student Union Building Georgian Room B. Lunch will be provided. For more information, contact David Murphy at 660.785.7246 or email dgmurphy@truman.edu. The full schedule of events is listed below. The Student Union Reservation Office will accept Spring 2015 event and meeting reservation requests from 8:30 a.m. to 5 p.m. Nov. 3-6. The Reservation Office will only accept paper requests. More information will be mailed to offices and departments Oct. 27. Packets will also be placed in student organization mailboxes located in the Center for Student Involvement Complex. Paper lottery forms can be found here beginning Oct. 27. Organizations and departments may print and complete forms, but may not submit completed forms until room lottery begins Nov. 3. The Reservation Office will not accept early requests. Confirmations will be mailed to campus offices and delivered to student organizations mailboxes in the lower level of the Student Union Building during the last week of classes. They will not be emailed. Any submissions received by the Reservation Office after Nov. 6 will be processed on a first-come, first-serve basis once all lottery requests have been processed. The Truman Public Relations Office is now accepting applications for the full-time Spring 2015 internship position. 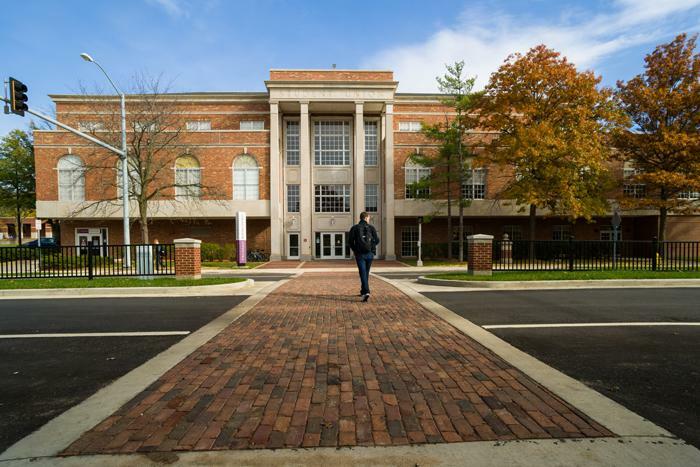 The public relations intern will be responsible for helping to write the online University newsletter, Truman Today, and the University’s magazine, Truman Review. The intern will also assist in planning special events throughout the semester, writing press releases and fulfilling other office tasks. Applicants should have a strong background in writing and editing. Communication majors are encouraged to apply, with special consideration given to candidates with knowledge of Associated Press Style. To apply, send a resume, two writing samples, an advising transcript and contact information for two on-campus references to the Public Relations Office, McClain Hall 202 no later than Nov. 3. For questions about the internship, contact Travis Miles at tmiles@truman.edu. After completing a bachelor’s degree and the specified pre-requisite courses, admitted students may finish a BSN degree in 15 months of study. For additional information, email nursing@truman.edu or call 660.785.4557. The nursing website includes information about the curriculum. Those planning to attend the information session should RSVP by sending an email to kmcdaniel@truman.edu. The Master of Arts in Education program is sponsoring a screening of the documentary “TEACH” by Davis Guggenheim from 7-9 pm. Nov. 5 in Baldwin Little Theater. The film follows the struggles and triumphs of America’s education system through the eyes, minds and hearts of its most essential resource, teachers. The event is free and open to the public. For more information, contact Pete Kelly at pkelly@truman.edu. 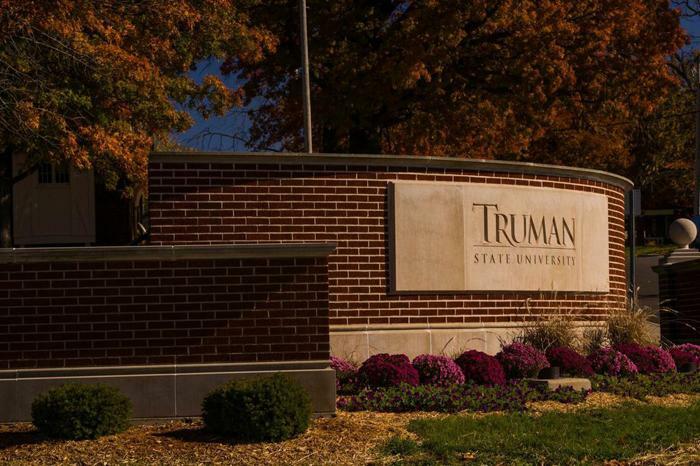 The Truman Communication Disorders (CMDS) Department will host a Graduate Student Open House from 10 a.m.-1:30 p.m. Nov. 8 in the Health Sciences Building 2203. All prospective students interested in pursuing a master’s degree in communication disorders from Truman are invited to attend. Information regarding the CMDS graduate program, the profession, employment opportunities and funding for graduate school will be provided along with the opportunity to meet faculty, alumni and students of the program. RSVP to Connie Ikerd, secretary. Auditions for spring placement in Cantoria or Women’s Chamber Ensemble will take place Nov. 17 and 18 in Ophelia Parrish and by appointment. Tenors and basses are especially encouraged to audition. If interested, email Mark Jennings at mdj@truman.edu to schedule an audition time. Students can also sign up for Cantoria, MUSI 149, or Chamber Choir, MUSI 147 section 6, when registering for classes. For more information, email Jennings at mdj@truman.edu or Victoria Meeks, Cantoria president, at vm1567@truman.edu. The School of Business is looking for eligible participants for the Gould Scholastic Award, sponsored by DST Systems, Inc., in Kansas City, Mo. The award represents Robert Gould’s legacy of effective utilization of operations management and information technology to advance the financial services industry. It recognizes outstanding university students who compose exceptional academic papers on topics related to investment management strategies, theories and trends. Winners are awarded grants in the amounts of $10,000, $7,500 and $5,000 for first, second and third place, respectively, and are celebrated at a special ceremony in Kansas City. The School of Business will additionally award local grants in the amounts of $500, $300 and $150 for first, second and third place, respectively. In order to be considered, individuals or groups must complete a research paper and bibliography that addresses the future of financial decision-making and its impact on financial services companies. Paper guidelines are available here. Students must be a junior, a senior or an Honors program student. Graduate students are not eligible to participate. The University may only submit three student papers to DST Systems, Inc., for review. Papers are reviewed locally first, and the top three Truman papers are forwarded to the next level. Submit papers to the School of Business at sbdean@truman.edu by Dec. 15. The Department of Public Safety would like to encourage students, faculty and staff to sign up for the University emergency text messaging system. Individuals can register by going to TruView. Sign in to TruView and click on the “Truman” tab. There will be a registration link in the lower right of the page under the “Update and View My Personal Information” channel on the “Emergency Text Messaging” link. A maximum of three phones can be registered to receive texts. Confirm information in the same manner. The campus is also encouraged to review the emergency procedures, which can be found here. It is important that the entire community is familiar with these procedures in order to understand how to respond appropriately in a number of emergency situations. The Learning Technologies Team is kicking off its Fall 2014 semester lineup of workshops and presentations with a focus on a wide array of teaching with technology topics. Join the Learning Technologies Team for these brown-bag lunch sessions on popular topics in instructional technology. While attendees eat, staff members will share information about apps and tools that can help provide better feedback, connect with out-of-town experts, get access to specialized training and much more. First Thursdays are Blackboard Thursdays! Blackboard Systems Admin, Sherry Dare, hosts open hours for those seeking Blackboard support and instruction. Sherry will be available in the McClain Hall 215 computer lab during this time to answer questions about using Truman’s learning management system, Blackboard Learn. This is an opportunity to drink some hot apple cider and visit with the Learning Technologies Team about instructional technology-related projects, ideas, successes or challenges. The Learning Technologies Team is also interested in ideas regarding future workshop topics. Stop in for hot apple cider and take a look at the extensive resources the Learning Technologies Team has available. The Learning Technologies Team will be available for questions after reflecting on the fall semester and in preparation for the spring. A modest admission fee will be charged. A model admission fee will be charged. For more information about any of these events please call 660.785.4417. Closed in between exhibitions and during University holidays. Priya Kambli, professor of art, has been shortlisted for the Source-Cord Prize 2014. The 25 shortlisted photographers were selected from a pool of 926 submissions. The prizewinners will be announced in early November to coincide with the special issue of Source magazine, a photography magazine based and published in the United Kingdom. Foundation scholarship applications for Truman students in the spring 2015 semester are now available. Applications are available online and are due by midnight, Nov. 3. To apply, log in to TruView, go to the Student Tab, Student Finances, Foundation Scholarships. The Summer 2015 application for the Critical Language Program is now open. This program is a fully-funded overseas language program for American undergraduate and graduate students with the goal of broadening the base of Americans studying and mastering critical languages. The Critical Language Scholarship provides study opportunities to a wide range of students with diverse interests, from a variety of fields of study, backgrounds and career paths, with the purpose of representing the full diversity of professional, regional, cultural and academic backgrounds from across the United States at every level of language learning. The application is available online at clscholarship.org. Applications will be due at 8 p.m. Nov. 1. Prior to preparing the application, interested students should review the full eligibility and application information on the program website. Scholarships are now available through Federated Garden Clubs of Missouri, Inc., for the 2015-2016 academic year. Two selected students will be submitted to Central Region as an applicant and to National Garden Clubs Inc., as a Missouri applicant to compete for a Central Region and National Scholarship. The scholarship application is available on the website. The deadline to apply is Feb. 1, 2015.